The Green infrastructure factor is a tool to ensure landscape is properly considered in planning urban development. The Greater London Authority (GLA) is considering incorporating the factor into the new London Plan. Last year GIC worked on a report for the GLA with TEC and Temple Group. Although the green space factor (GSF) maybe a more familiar term, the green infrastructure factor term is being used to highlight the multi-functional benefits of landscapes in cities. Berlin developed the concept (the biotope factor) during the 1990’s. The city’s concerns with surface flooding and lack of green space drove the idea. The factor aimed to ensure better green space in developments. Our experience of these approaches significantly informed our work for the GLA. We had some involvement with the City of Stockholm. Furthermore, we visited Seattle and observed how the factor worked in action. The various factors are a tool for planners and landscape architects. 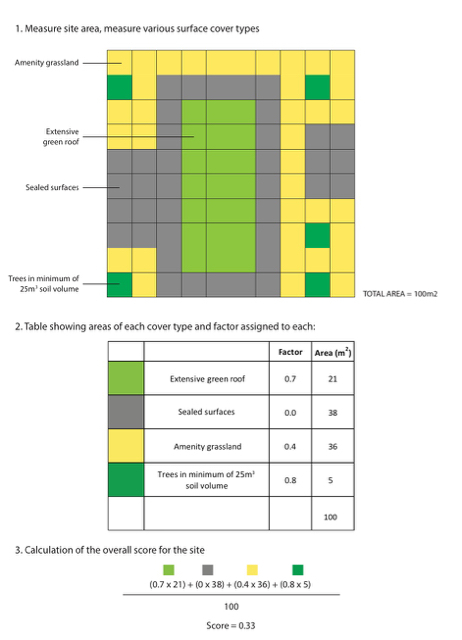 The tool evaluates the quantity, and to a certain the extent the quality, of green space functionality. The scoring system allows for a total value to be assigned to a development. Authorities set a minimum score. Where this minimum score is not met, plans are revisited and altered. This ensures that adequate green infrastructure is provided in new developments. GSFs are a tool for planners. The tools do not measure biodiversity loss or gains. Furthermore, they do not replace BREEAM or other environmental performance measurement schemes. In London, it is envisaged that GSFs will be used to ensure that there is adequate green infrastructure. This will be especially important in densely developed areas, regeneration projects or special development zones. Planning authorities will be able to adjust the scheme to suit local conditions and priorities. GIC was pleased to work on this project. Having seen the success of the approach in other cities, we believe this will help increase the use of GI in London. And we are sure the concept will spread across the UK. If, and when it is adopted, GIC are keen to work with others to make the tool work.